COLUMBUS, Ga. - (WRBL) - Tickets are now available for one of the most anticipated attractions in the state: the Thunder in the Valley Air Show. 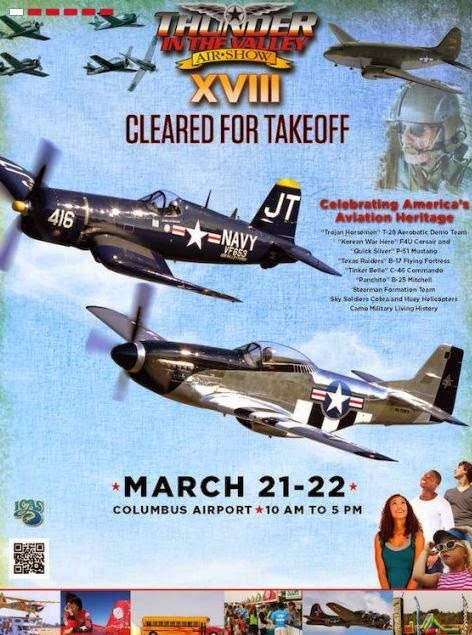 The air show is "cleared for takeoff" at the Columbus Airport March 21-22. Tickets can be purchased online or at multiple retail stores. To purchase tickets online, please visit www.thunderinthevalleyairshow.com. A $1.50 service fee will be applied to each online ticket purchase. Military personnel may purchase advance tickets for $8 each at Fort Benning's MWR Tickets and Travel. All tickets are $15 per person on the day of the show. Children ages 6-years-old and younger get into the air show free. The Thunder in the Valley Air Show will feature a variety of vintage and modern aircraft, including the Trojan Horsemen, a six-ship team of WWII-era T-28 Trojans, and the Class of '45, a high-speed tandem act featuring an F4U-4 Corsair and a P-51 Mustang. Visitors can also stop by to see Jacquie B Airshows, a thrilling aerobatic routine by one of the most accomplished female pilots in the air show business. Other attractions include Kent Pietsch Airshows, a comedy act featuring the colorful “Jelly Belly” Interstate Cadet; and a pair of renowned WWII bombers, the “Texas Raiders” B-17 Flying Fortress and the “Panchito” B-25 Mitchell. Thunder in the Valley Air Show will also include an array of engaging ground attractions, including “Tinker Belle,” a Curtis C-46 Commando transport aircraft; the Lockheed 12-A that starred in the movie “Amelia;” military vehicles from the CAMO Group; a Kids Carnival; and the 9/11 NEVER FORGET Mobile Exhibit, which honors those who lost their lives on September 11, 2001. The air show has been flying high since 1997, and now depends on the help of more than 300 volunteers to entertain and inform families all across the Chattahoochee Valley. Local ticket outlets accept cash only. Each ticket is valid only for one of the two show days. To attend both days requires two tickets. There will be no rain dates or refunds. Online advance tickets will be available until 11:59 p.m. on Friday, March 20. Retail locations will offer advance tickets until close of business on Friday, March 20. Only $15 Day of Event tickets will be sold after that. Gates will open at 10 a.m. and close at 5 p.m. on both Saturday, March 21 and Sunday, March 22. For more information on the event or how you can become a sponsor, visit www.thunderinthevalleyairshow.com. AMARILLO -- Local law enforcement is reminding and warning everyone about the dangers and punishment for shooting a laser into the cockpit of a plane or helicopter. In June of 2014, the local DPS helicopter was illuminated by a laser. Both men were found guilty and sentenced for the crime. On June 3, 2014, an FBI press release announced a “national campaign to deter people from pointing lasers at aircraft, a federal violation that presents danger to pilots, passengers, and those on the ground.” The release further mentioned that the FBI is offering a reward of up to $10,000 for information that leads to the arrest of any individual who aims a laser at aircraft. Since the FBI and the Federal Aviation Administration (FAA) began tracking laser strikes in 2005, data shows a more than 1,100 percent increase in the deliberate targeting of aircraft by people with handheld lasers.” A violation of the federal law can result in a maximum of five years in prison and up to a $250,000 fine. The statistic quoted shows that this type of incident is increasing. According to information provided by the DPS, this type of activity can be particularly dangerous when the aircraft is a single pilot vehicle such as an EMS or other helicopter which may be operating close to the ground or at night. A small hand-held laser can dangerously impair the pilot’s ability to see unlit obstacles that could then be hit by a part of the aircraft. The result could be a deadly accident. If you have information about a lasing incident, call the local FBI field office or the Amarillo Crime Stoppers, or the Amarillo Police Department. If you see someone pointing a laser at an aircraft, call 911. "The benefit after figuring out what happened means that it's probably not going to happen again." 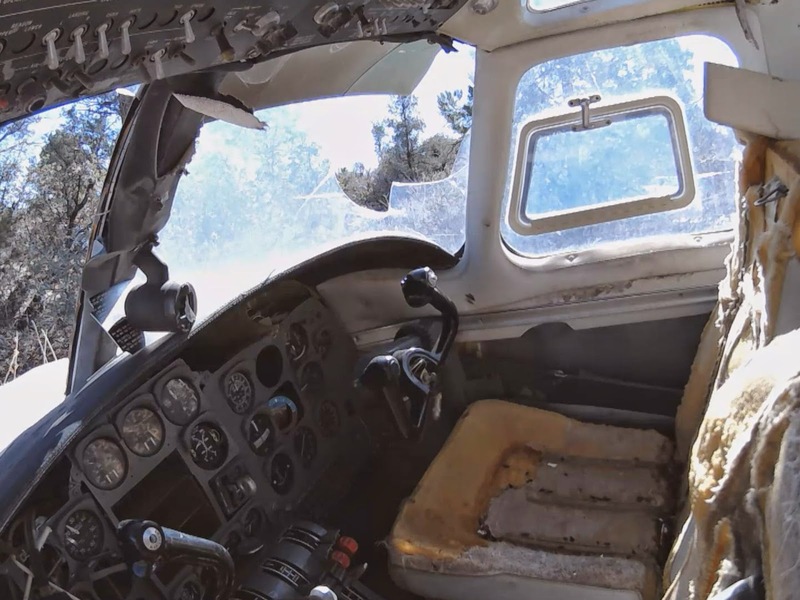 In a fenced-off patch of high desert, Embry-Riddle Aeronautical University is training future cash investigators using real-life wrecks. The gate to the crash lab sits inside a giant circular engine cowling from a Boeing 747. Step inside and there are severed tails, broken cockpits and crumpled wings everywhere. "It's a puzzle," student Julie Bales said. "I like puzzles. And the benefit after figuring out what happened means that it's probably not going to happen again." The planes are from across the country. Private planes become the property of the surviving owners or their families once the NTSB is finished with its investigation. Embry-Riddle asked for donations and got a collection of wrecks, from small single-engine planes to larger commuter aircraft. One, a Varga single-engine plane, sits under an awning, nose straight in the ground. The cockpit is almost unrecognizable. A single lap belt sits in what's left of the seat. The plane hit the ground so hard the pilot's body was cut in half. "Half his body was still in the aircraft," student Eleazar Nepomuceno said, picking up the seatbelt. "The other half was pretty much launched." But details like that help the students investigating the crash. The aluminum on both sides of the cockpit is crumpled like an accordion. That tells investigators the plane hit evenly, without spinning. The real-life NTSB investigation found the pilot had failed his medical screening and wasn't certified to fly, but took off anyway. Nepomuceno says the pilot probably had a heart attack in midair. Everything from radio communication to fuel levels and the weight of the passengers has to be taken into account. "Some people pick it up faster than others," Nepomuceno said. 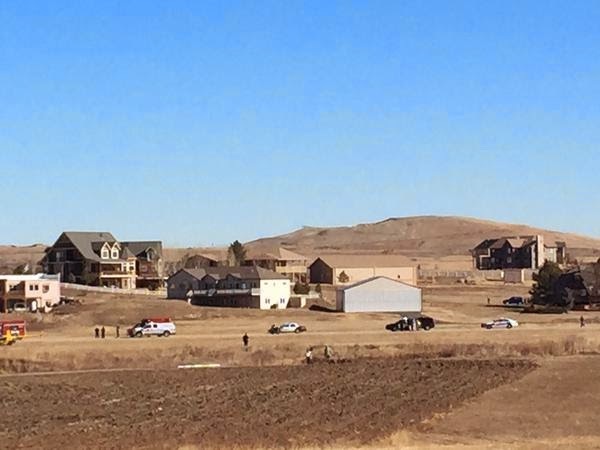 A few dozen yards away, another plane has been reduced to parts spread out over a large area. It was a big plane, eight or more passengers. The tail sits upright at one end of the field, a tangle of wires marks what's left of the cockpit at the other end. Bales said when she first saw the crash lab, she didn't know where to start. But Nepomuceno explains that's why the lab exists. Students should see the debris field and methodically examine it. In the large debris field, students should discover that the tail of the aircraft is charred, but only on one side. That should lead to them to the left engine, where faulty wiring caused an explosion in the fuel tanks, lighting the engine on fire. It's hard, sometimes gruesome work. But that's what the students signed up for, and they believe their work is for the greater good. "That's our duty to families of the occupants of the aircraft and to society in general," student Taylor Smith said. "To make aviation safer." On February 8, 2015, about 1407 eastern standard time, an American AA-1, N6116L, collided with trees then the ground during a forced landing shortly after takeoff near Fort Meade, Maryland. The commercial-rated pilot and one passenger sustained serious injuries. The airplane was substantially damaged and was co-owned by three private individuals, operating under the provisions of 14 Code of Federal Regulations (CFR) Part 91 as a personal, local flight. Visual meteorological conditions prevailed at the time and a Washington, DC, SFRA flight plan was filed. The flight was originating at the time of the occurrence. The pilot stated that the purpose was to perform touch-and-go landings to verify that previous repairs related to engine roughness eliminated the problem. He performed a preflight inspection of the airplane, and reported that no contamination was noted in the fuel sample from each tank that had 3/4 capacity. After engine start he taxied to runway 28, and performed a full power engine run-up that lasted between 2.0 and 2.5 minutes; the magneto drops were equally 75 rpm, and no engine roughness was noted. With no flaps extended, the auxiliary fuel pump on, and the fuel selector on the right tank, he initiated takeoff from runway 28. He reported that during the takeoff roll when at 60 to 70 miles-per-hour (mph), he noted red line rpm of 2,500. The airplane became airborne about midpoint of the runway (normal), and he began climbing at 80 mph, which is Vx. About 30 to 40 seconds after full power application, while at about 250 feet above ground level, he noted an abrupt partial loss of engine power. He reported that the engine rpm dropped from 2,500 to 1,500 then went to 1,900. He cycled the magneto switch, applied carburetor heat, and then turned off the auxiliary fuel pump, but those actions did not restore engine power. He flared at tree top height, and the airplane collided with trees, then impacted the ground inverted. FORT MEADE, Md. (WJZ) — One of the pilots trapped when their small plane went down near Fort Meade has just been released from the hospital. He’s giving WJZ his account of how he survived that crash in the woods. Rick Ritter has his story. Barnett just got out of the hospital Friday. He’s upbeat and in good spirits, but says he’s certainly very lucky to be alive. A broken sternum fractured vertebrae and bruises all over. Jeff Barnett, 57, can barely move. “You hit the trees at about 65, 75 miles-per-hour. After that, fate kind of takes over,” he said. Fate that helped the longtime pilot live to tell his dramatic story. “I’m very blessed and I keep telling him it was a miracle,” his wife, Melissa Barnett, said. 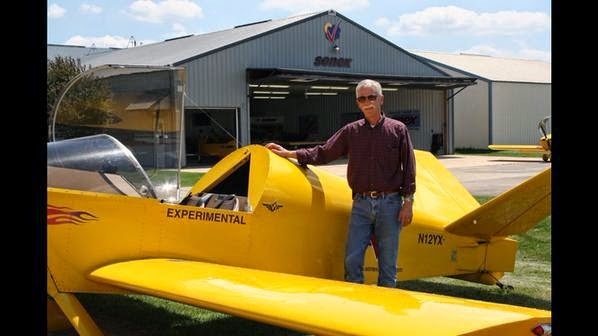 Sunday afternoon, Barnett’s single engine plane spiraled down into the woods near the Tipton Airport. On board–his close friend, 82-year-old Thomas Cline. Rescuers scrambled to pull the two from the submerged wreck. They were both rushed to Shock Trauma. “We were both very alert. Tom said, ‘Jeff, we’ve alive. We’re alive,’” said Barnett. Barnett described what he called a beautiful day for flying that quickly turned disastrous after taking off. “As we approached the trees, maybe 50 feet above them which would be normal for that airplane, the engine began to lose power,” he said. Leaving the Glen Burnie pilot with just moments to make a life-saving move. With a smile, Barnett said he never doubted his experience in the life or death moment. A traumatic collision that would keep many off a plane for the rest of their lives—but not Barnett. “It’s part of our lives, so we’re not going to give that up, of course,” he said. The NTSB took the lead on the investigation. Still no word on what exactly caused the engine to start losing power. Officials say the plane was registered to both Barnett and the passenger. DULUTH, Minn. (NNCNOW.com) -- Cirrus aircraft in Duluth has announced they're expanding operations both on, and off, the runway, which would bring more jobs to the region, and help secure Cirrus's place in the world aviation market. City leaders are now asking state lawmakers for $4 million to help the expansion soar to new heights. Cirrus's expansion project has two main components. The company is already in the process of moving some of its features that don't depend on having the Duluth International Airport runway into a new building along the Miller Trunk Highway. Cirrus CEO Dale Klapmeier says that will make room for a new completion facility on–site, that would pump out the company's Vision jet. Klapmeier says they already have over 500 advanced orders for the plane. "We expect to see customer deliveries within the next year, and then the growth path to meet those demands is what determines that timeline for the building," said Klapmeier during the announcement Friday. Both Klapmeier and Mayor Don Ness say that timeline is time critical, which is why they're taking a $4 million investment request to Governor Dayton, and state economic leaders, this legislative session. The other $6 million would come from the city, paid for through a combination of tax increments that would come from the new structure and lease payments that Cirrus would pay to cover that difference. "This is a model that has been proven successful in the past with previous expansions, and we're looking to employ that same sort of approach to this new expansion," said Mayor Ness, "that will facilitate not only the growth of this company, but very important job growth in the region. While not specific on the potential growth, Klapmeier says they've added over 300 new jobs in the past three years with intention to reach a similar figure in the next three years. Mayor Ness says the project would attract worldwide revenue. "But there's only a few industries that we have in this region that bring in outside money into our economy, and aviation is one of those key industries," added Ness. Mayor Ness says it would also further secure Cirrus's place in the world aviation market, which is why lawmakers need to act this session. Cirrus spokespeople say 2014 was the best year in deliveries for the company since 2008. Currently, there are nearly 6,000 Cirrus airplanes in the field. DULUTH, Minn. -- As Duluth-based Cirrus Aircraft nears production of its new Vision SF-50 light jet, the company faces a problem. It's in dire need of more production space. To ensure that the jet is built in Duluth and that the company has room to grow, the city of Duluth wants to build a $10 million facility on city-owned land just southeast of Cirrus' headquarters and production center at the Duluth International Airport. The plan, announced by Duluth Mayor Don Ness on Friday, calls for $4 million in state funding. The funding will be sought from the state's general fund and Department of Employment and Economic Development programs. The city would kick in $6 million through the establishment of a tax-increment financing district. Taxes and lease payments paid by Cirrus would help repay the cost of the project. Similar approaches have been used with other business expansions in Duluth, including the former Northwest Airlines Maintenance Base built in the 1990s. The city also built Cirrus' Customer Center about 12 years ago which the company leases. But for Cirrus, the timing is critical for this latest 60,000-square-foot expansion. Action by the state Legislature would be needed this session, say both Ness and Cirrus CEO Dale Klapmeier. Ness has talked to Gov. Mark Dayton and local legislators about the project, with the response so far positive, city staff say. Cirrus needs the additional facility as it revs up production of its groundbreaking personal jet in the next year, and starts filling the more than 500 orders it has for the $2 million aircraft. After years of development, Cirrus' single-engine jet is expected to get certified by the Federal Aviation Administration, start production and deliver its first plane by the end of the year. Just this week, Cirrus added 40,000 square feet of space at 4950 Miller Trunk Highway, an off-airport location where machining, sub-assembly production, equipment testing and research and development will occur. At full capacity about 50 people will work there. "Moving to that building opened up space we need to finish certification and see us through (the first) deliveries," Klapmeier said. But beyond that, Cirrus will need the proposed $10 million facility to serve as the completion center for finishing work on the jets, as well as provide room for the company to grow. "We will be time-critical in about a year from now," Klapmeier said. Ness said Duluth is a player in the aviation sector. He wants the aviation hub in Duluth to grow. And this new Cirrus facility is critical for that to happen, he said. "There's no question it's Cirrus that's the aviation core of Duluth," he said. "We want to ensure Duluth is the place where Cirrus continues to grow." In the last three years, Cirrus has been on a growth spurt. Deliveries of its SR-20, SR-22 and SR-22Ts single-engine piston planes have been building after several years of declining numbers due to the lingering impact of the economic recession. The company has added 300 jobs, many for its jet program. That brings its total staff to more than 825, with 650 in Duluth, company officials say. Klapmeier says that job growth will continue in the future, though he declined to say how many jobs will be created. In its news conference announcement, however, the city said more than 150 additional jobs could be generated. BETTENDORF, Iowa (KWQC) — A retired Bettendorf High School history teacher says World War I marks a great transition. The war brought about the birth of aerial warfare. Don Keeney enjoys building model airplanes, and has dozens of open cockpit planes on display at the Bettendorf Public Library. The planes are replicas of those flown by fighter pilots in the First World War. Keeney buys the kits, assembles the models, and does his research. He is a wealth of knowledge about the planes, pilots and squadrons. The detail and decals are impressive. Planes which changed the way war was fought. Guns mounted on open cockpit planes. Pilots, Keeney says, shooting at the enemy to gain control of the air. In his collection, Keeney built a model of the plane Captain Eddie Rickenbacker flew during the First World War. As a fighter pilot, Rickenbacker shot down twenty six enemy planes. Keeney also built a model of the fighter plane flown by the Red Baron. Germany’s ace pilot who shot down eighty enemy planes. Included in the collection at the library is the helmet Don’s great uncle wore while serving in the war. The helmet is painted with the French and American Flags. Keeney also has his great uncle’s gas mask bag. Poison gas was used during the war. Keeney builds other model planes and ships. Preserving part of American History. The collection is on display at the Bettendorf Public Library through the end of February. Residents around Monterey Bay were startled Friday afternoon by the sight of F-15 fighter jets in the skies above them corralling an aircraft flying in an area that was restricted due to President Obama’s visit. Just before 2 p.m., F-15s under the control of the North American Aerospace Defense Command, known as NORAD, saw an unresponsive aircraft enter airspace that was restricted due to Obama’s attendance at a cybersecurity summit at Stanford University. Curious onlookers from San Francisco to Santa Cruz quickly took to social media, wondering why military planes were buzzing about at breakneck speeds. But, soon enough, the unresponsive plane re-established communication and was followed south to Half Moon Bay, where it landed without incident, according to a statement from NORAD. SAN FRANCISCO (CBS SF) – Two fighter jets were called to the skies above San Francisco Friday afternoon after a plane entered airspace that has been restricted during President Barack Obama’s visit to the Bay Area. According to a statement from the North American Aerospace Defense Command (NORAD), two F-15’s found a general aviation aircraft in the airspace and the plane was out of communication. NORAD said the plane was able reestablish communications. The plane was then escorted by the fighter jets to Half Moon Bay, where it safely landed. Mr. Obama arrived in the Bay Area on Thursday. The president was at Stanford University on Friday for a summit on Cybersecurity and a roundtable with local business leaders. He returned to San Francisco late Friday afternoon for a Democratic National Committee fundraiser. The president will depart San Francisco International Airport for Palm Springs on Saturday morning. PETERSON AIR FORCE BASE, Co - Fighter jets under the control of the North American Aerospace Defense Command visually identified a general aviation aircraft in the Temporary Flight Restricted (TFR) area over San Francisco, Calif., today, Feb. 13, 2015. At approximately 1:50 p.m. PST, two F-15s visually identified a general aviation aircraft that was out of communication in the TFR. The aircraft re-established communications and was followed by the fighter jets until it safely landed at Half Moon Bay. Information on the San Francisco TFR beginning on Feb. 13 and ending Feb. 14 can be located at http://tfr.faa.gov/save_pages/detail_5_1405.html. Information on the upcoming TFR for Palm Springs, CA beginning on Feb. 14 and ending on Feb. 16 can be located at http://tfr.faa.gov/save_pages/detail_5_2321.html. The flight instructor and the student pilot were conducting a local instructional flight in the helicopter. The helicopter was on final approach to land when one of the three main rotor blades (#2 blade) separated from the main rotor head. The main transmission and main rotor head (with #1 and #3 blades still attached) then separated from the helicopter, and the helicopter descended to ground impact. Examination of the wreckage revealed that the separation of the #2 blade was due to fracture of the #2 main rotor blade spindle. The #2 spindle fractured at the inboard end of the threads. Metallurgical analysis of the fractured spindle revealed signatures consistent with a fatigue crack initiating from multiple origins that propagated across 92% of the spindle cross-section; the remaining 8% of the fracture surface exhibited signatures consistent with overload. The high percentage of stable fatigue fracture growth versus overload suggested that low loading propagated the crack. Further, corrosion was visible on the fracture surface in the fatigue initiation area, which indicated that the crack had been present and growing for some time. Similar fatigue cracks were observed emanating from thread roots on the #1 and #3 spindles; the crack in the #3 spindle emanated from the inboard-most thread, similar to the crack in the #2 spindle, and the crack in the #1 spindle emanated from the cotter pin hole. Both of these cracks were shorter than the crack in the #2 spindle, and the fatigue on their fracture surfaces had only propagated a small amount through the #1 and #3 spindle cross-sections. The root radii of the threads on all three of the spindles did not meet the thread form specified on the manufacturer's drawing. Cross-sections of the threads from the three spindles showed that the #2 spindle and the #3 spindle had flat-bottomed threads; the #1 spindle did not have flat-bottomed threads but had threads with a sharper than specified root radius. A subsequent finite element analysis determined that the flat-bottomed threads and the sharper than specified root radius threads would result in higher stresses at the threads, which likely contributed to the crack initiation within the threads. Further, the investigation determined that the predicted loads used in the original fatigue analysis during the design of the spindle did not account for a bending load at the spindle threads. The omission of bending loads during design and the flat-bottom quality of the threads led to stresses greater than used in the original fatigue life calculation by the manufacturer. Further, the finite element analysis of the spindle revealed that, once a crack has initiated, the bending loads at the spindle threads would be sufficient to propagate the crack at a rate similar to that of the total time accumulated on the #2 spindle (about 9,300 flight hours). Before the accident, the spindle was not a life-limited part, and there were no recurrent inspections specified for the spindle threads, resulting in a low likelihood of the operator detecting the fatigue fracture within the spindle threads before the accident. Following this accident, the manufacturer released a service directive bulletin and the Federal Aviation Administration released an airworthiness directive that require a magnetic particle inspection of spindles with 1,500 hours or more time in service. An in-flight failure of the helicopter's #2 main rotor spindle due to undetected fatigue cracking, which resulted in an in-flight breakup. Contributing to failure were the nonconforming thread root radius of the spindle and the manufacturer's failure to include a bending moment within the spindle threads when performing the fatigue analysis during initial design of the spindle. 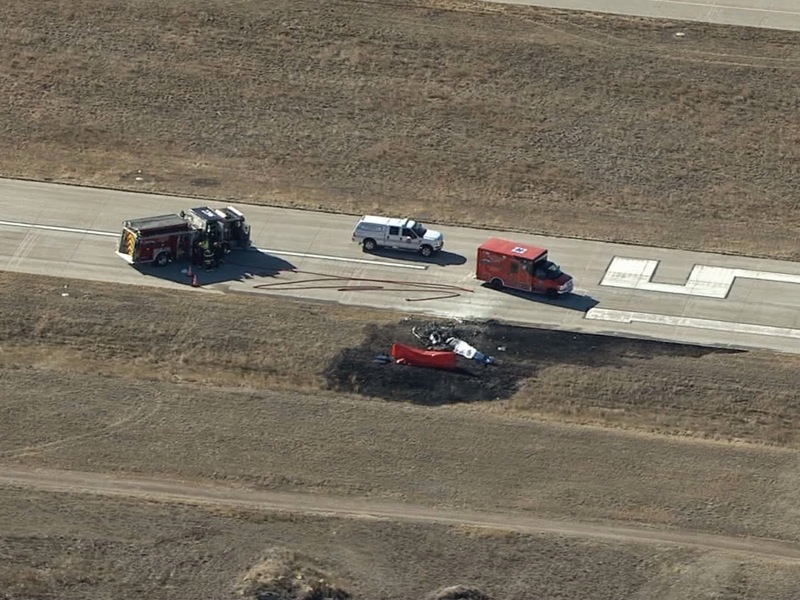 On January 26, 2015, about 1202 mountain standard time (MST), an Enstrom 280FX, N86235, was destroyed when it impacted terrain during final approach for landing at Erie Municipal Airport (EIK), Erie, Colorado. Both the instructor pilot and student pilot were fatally injured. The helicopter was registered to New Course Aviation Company and operated by Mountain One Helicopters as a 14 Code of Federal Regulations Part 91 instructional flight. Visual meteorological conditions prevailed for the local flight, which operated without a flight plan. According to a witness interview, the helicopter was on final approach to land on the runway at what seemed like a steep angle of descent. As the helicopter descended, she heard a loud "pop." After the pop, the helicopter began to rotate and then the main rotor (MR) blades separated from the top of the helicopter. The remainder of the helicopter descended to ground impact and then "exploded." All three MR blades were found during the on-scene investigation and were identified as blades #1 through #3. The #2 MR blade was found separated from the MR head, which still contained MR blades #1 and #3. Post accident examination revealed that the #2 MR blade had separated due to a fractured spindle. The helicopter, an Enstrom 280FX, was a three-seat, single-engine helicopter (serial number 2002) manufactured in 1985. The three-bladed MR system was powered by a turbo-charged Lycoming HIO-360-F1AD engine rated at 225 horsepower at 3050 rpm. The inboard end of each main rotor blade is attached to its respective grip and drag link. Each rotor blade is attached to the outboard side of its respective grip via a retention bolt. At the inboard side of each grip, a pitch arm and drag link are attached to the leading and trailing sides, respectively, of the grip. Two feather bearings, which accommodate rotor blade pitch change motion, a bearing spacer, and a spindle are installed within the grip. A Lamiflex bearing, a spindle retention nut, and a cover are installed at the threaded outboard end of the spindle. Two flanges at the inboard end of the spindle attach to a universal block, the latter of which is attached to the main rotor hub, that accommodate rotor blade flapping and lead-lag motions. See figure 1. According to the maintenance records, the most recent 100-hour inspection was completed on March 17, 2014, at an airframe total time of 9,167 hours. During this annual inspection, all three Lamiflex bearings were replaced. Additionally, all three MR grip assemblies were removed to "purge and clean" the flapping hinge bearings, then were reassembled and preloaded per the Enstrom Maintenance Manual. Lastly, the leading-edge tape was replaced on one of the MR blades; the helicopter was then flight tested and subsequently adjusted for proper track and balance. No other maintenance to the MR grips or blades was performed during this inspection or at any other time between the inspection and the accident. According to the maintenance records, the #2 spindle, part number (P/N) 28-14282-13, serial number (S/N) 03-014-84N, had not been replaced since the helicopter's manufacture. At the time of the accident, the spindles were not life limited, and there were no recurrent inspections specified for the spindle threads. According to the Enstrom Maintenance Manual, the Lamiflex bearings required replacement every 5 years. When the MR is assembled, the spindle threads reside under the retention nut retaining the Lamiflex bearing. The retention nut must be removed in order to examine the entire threaded region of the spindle for damage. It is unknown whether a thread crack, once grown to a sufficient depth, would produce an out-of-track MR blade. Examination of the maintenance records for the accident helicopter revealed at least 9 instances, from the time the helicopter was manufactured, of Lamiflex bearing replacement for the #2 spindle. (The Enstrom Maintenance Manual the Enstrom Maintenance manual requires the lamiflex bearing to be replaced every 5 years.) However, there was no pattern in the Lamiflex bearing replacement intervals or interrelated note of the helicopter's MR track and balance or the helicopter's flying characteristics. During manufacture, the cotter pin hole in the spindle is match-drilled with the spindle retention nut installed. There is no specific requirement on the dimension for the cotter pin hole in the engineering drawing to break the sharp edges or chamfer the edges at the cotter pin hole after it is match-drilled. Breaking or chamfering the sharp edges is typically used to reduce stress concentrations that may arise from the matched-drill process. The 1155 weather observation at EIK reported no wind, visibility 10 miles, clear skies, temperature 09ºCelsius (C), dew point 11ºC; barometric altimeter setting 30.18 inches of mercury. EIK is a publicly-owned airport without an air traffic control tower. The airport was equipped with one runway designated as runway 15/33. 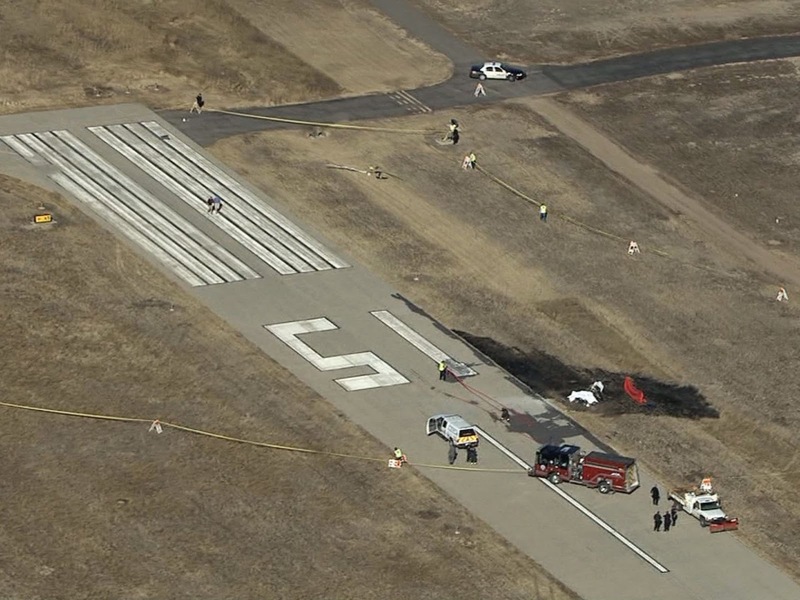 Runway 15/33 was a 4,700-ft-long by 60-ft-wide runway and was reported as "in good condition." The elevation of the threshold of runway 15 was about 5,076 ft above mean sea level. 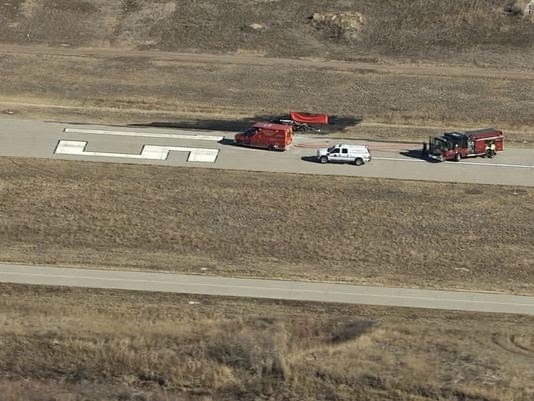 The helicopter came to rest upright with the right skid low off the east side of the runway. The main wreckage contained the main fuselage (flight deck, skids, tail boom) and engine. The aircraft wreckage displayed severe damage from a high energy vertical impact and post impact fire. The MR head (with the #1 and #3 MR blades still attached) and MR gearbox were located about 299 ft from the main wreckage at a heading of 350º. The threaded portion of the spindle and associated retention nut on the #2 blade was missing; however, the inboard portion of the spindle was still attached. The #2 MR blade assembly, including the blade, the grip, the threaded portion of the spindle, the retention nut, and the drag link, was located about 657 ft from the main wreckage at a heading of 263º. The #2 blade did not exhibit any damage or indications of contact with any part of the aircraft. 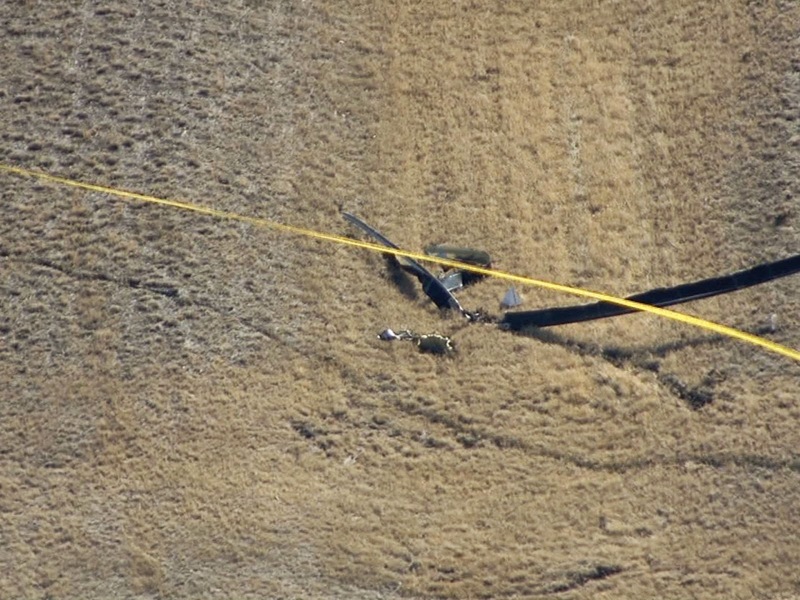 An approximate 18-inch section of the leading edge spar and balance weight for the #1 rotor blade was located about 493 ft from the main wreckage at a heading of approximately 248º. The tail rotor blades were found about 290 ft and 666 ft from the main wreckage, at headings of 276º and 325º, respectively. 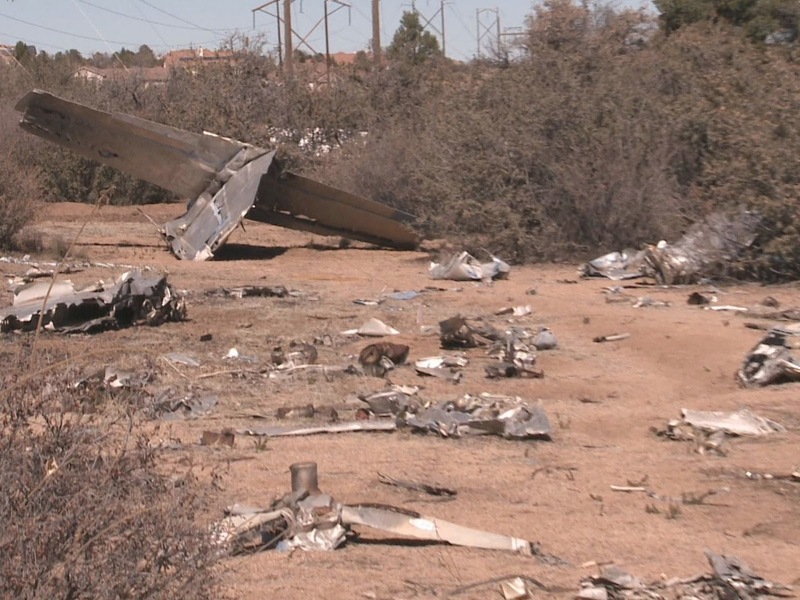 Several other pieces of wreckage were scattered around the approach end of runway 15. The tail rotor gearbox was not located. Flight control continuity was established in the cabin area from the controls up to the MR gearbox and MR hub. The Hobbs meter located in the center pedestal indicated 9,332.7 hours. The tailboom exhibited a MR blade strike. Examination of the MR gearbox mounts indicated that the gearbox mounts were intact and separation from the airframe occurred at the pylon. The overrunning clutch operated normally. During the wreckage examination at the recovery facility, the #2 MR blade assembly (S/N 3469) was disassembled by removing the blade from the grip and removing the Lamiflex cover. The retention nut was found behind the cover with the fractured threaded end of the spindle still attached to the nut, and the cotter pin installed. Additionally, the Lamiflex bearing and shims were located behind the cover. The Lamiflex bearing (S/N 9383) had a manufacturing date of February 7, 2013. The three sets of spindles, nuts, shims, grips, and Lamiflex bearings from the helicopter's rotor arm assemblies were sent to the NTSB Materials Laboratory in Washington, DC for detailed examination. The threaded end of the #2 spindle had separated in-flight and was submitted still assembled inside the mating #2 retention nut. With exception of a small region on the #2 spindle threaded end fracture surface, most of the fracture surface of the #2 spindle was covered in a black-colored substance consistent with degraded grease. Dirt and debris coated the surface of the remaining inboard portion of the #2 spindle. The threaded end of the #2 spindle was disassembled from the mating #2 nut, cleaned, and examined in more detail. About 92% of the fracture surface on the separated #2 spindle was flat, and had beach marks consistent with fatigue cracking. (Beach marks are macroscopic progression marks on the fracture surface of a fatigue crack that indicate successive positions of the advancing crack front.) The separation occurred through the root of the end thread (thread closest inboard), and the fatigue crack emanated from the trailing edge (TE) side of the spindle. Corrosion was visible on the fracture surface of the #2 spindle in the fatigue crack initiation area. The remaining 8% of the fracture surface on the separated #2 spindle was rough and had a shear lip, which was consistent with overload. The shear lip was on the leading-edge side of the spindle, opposite the fatigue crack initiation area on the TE side. This was the same area on the fracture surface that was not covered with black grease. The fracture surface in the area of the shear lip on the #2 spindle fracture surface had features showing microvoid coalescence, which were consistent with overstress. On various portions across the entire fracture surface, shiny areas consistent with mechanical damage were observed. The average root radius measurement for the #2 spindle was smaller than what was defined in the thread form profile specified by the Enstrom spindle drawing. The remainder of the thread features conformed to the required thread form profile. For additional details of the thread form profile, see the Materials Lab Factual Report in the docket for this investigation. A cross-section was prepared through the separated #2 spindle threaded end. The hardness of the #2 spindle was within the range specified on the Enstrom spindle drawing. The threads of the #2 spindle were examined in the prepared cross-section. Corners with tight radii were observed in the flat-bottomed thread roots. The threads looked to be cut, rather than rolled, and no decarburization (a process used to reduce the carbon content in metal) or abusive machining was detected. The microstructure of the #2 spindle was tempered martensite and consistent with alloy steel. The #1 and #3 spindles were completely covered in red/brown grease; the grease was removed and the threaded ends were further cleaned for detailed examination. The average root radius measurements for the #1 and #3 spindles were smaller than what was defined in the thread form profile specified on the Enstrom spindle drawing. The remainder of the thread form features conformed to the required thread form profile. The threads on the #1 spindle were flat-bottomed and had tight radii in the corners, similar to the threads on the #2 spindle. The threads on the #3 spindle were not flat-bottomed, but the radii were smaller than specified. The threaded ends of the #1 and #3 spindles were examined using magnetic particle inspection (MPI). Multiple MPI indications were observed in the thread roots of both spindles. There was one very bright linear crack indication in the root of the end thread on the trailing edge (TE) side of the #3 spindle, which was the same location from which the fatigue cracking on the #2 thread initiated. A bright linear crack indication was also observed in the root of one of the threads on the #1 spindle on the TE side. However, this indication was observed in the root between two threads about mid-length down the threaded end and in a thread root adjacent to the cotter pin hole. A portion of the crack indication was visible on the inner diameter of the cotter pin hole. The crack indication extended out of the cotter pin hole towards the top side of the #1 spindle. Additional MPI indications also were observed running parallel along portions of multiple thread roots. The parallel indications were in similar locations to where the spindle #2 had tight radii in the thread corners. The fracture surfaces of the cracks in the threads of the #1 and #3 spindles were flat with features consistent with fatigue cracking. Dark areas were observed on the fracture surface of the #3 spindle, consistent with corrosion products. No metallurgical issues were observed with the remaining components of the rotor arm assemblies. As a result of the fatigue cracking and fracturing found on the helicopter's spindles, FE modeling was performed to examine local stresses on the spindle. Modeling revealed that there was a possibility that, in addition to a longitudinal centrifugal force, the loading on the threaded portion of the spindle may include lateral forces and bending moments. Two regions of interest were studied: the threaded portion of the spindle where the #2 spindle separated due to a fatigue crack that propagated and the cotter pin hole region where cracks were found in the #1 spindle. In November 2015, Enstrom instrumented the MR spindles of an exemplar helicopter with strain gauges to determine whether there was existence of bending loads at spindle threads. These tests revealed that a bending moment existed that increased the stresses in the threaded area of the spindle with a bending moment that was not previously accounted for during the spindle design. The measured #2 spindle profile was used to construct the FE model of the accident spindle. The corner radii were chosen to be 0.003 inch for all thread roots. A model of a spindle with specified larger 0.009" thread profile was also constructed for comparison purpose. The 2-D models with these two profiles will be referred to as the "measured" model and the "nominal" model. The geometry of the nut was approximated from design drawings. The only external load considered for the 2-D model was the axial centrifugal force due to blade rotation. According to Enstrom, during the design of the spindle it was assumed that this was the most significant load acting on the threaded portion of the spindle. The magnitude of the force was chosen to be 21,460 lbs, which, according to design calculations, corresponded to the maximum force allowed at a rotation speed of 385 rpm. This force was applied as a pressure to the nut surface contacting the Lamiflex bearing (which was not included in this model). This surface was constrained to remain horizontal during the simulation, which is an assumption that was intended to account for the stiffness of the Lamiflex bearing. The Lamiflex bearing is stiff, it is not rigid as discussed later in this report. This assumption resulted in a nonuniform pressure distribution on the loading surface. The longitudinal normal stress was the dominating stress component of the analyses and was the primary quantity of interest. With the measured thread profile, the peak stress occurred in the root region of the first tooth from the bottom, which coincided with the location of the crack that caused the failure of the #2 spindle. With the specified thread profile, stress values were the highest in two regions: the first tooth root and the stress relief feature beneath the threads. The peak stress magnitudes were 149 ksi and 84 ksi for the measured and nominal thread profiles, respectively. During the investigation, it was determined that there was a possibility that in addition to the longitudinal centrifugal force, the loading on the threaded portion of the spindle may include lateral forces and bending moments. A 3-D model of the entire retention assembly was built to compute the loads to be applied to the detailed local 3-D FE models of the threaded portion of the spindle. The global 3-D FE model consisted of the flapping pin, the blade grip, the spindle, the two bearings inside the grip, the Lamiflex bearing, and the nut. The forces and moments obtained from the global analysis were applied to the local model as external loadings. The loadings were applied in two steps. In the first step, only the axial force was applied. In the second step, the two transverse forces and the two bending moments were applied in addition to the axial force. This was done to study the effect of bending moment and transverse force, which was accomplished by looking at the differences in stress values between the two loading steps. To represent the most severe loading scenarios, 4 cases were developed to analyze the 'worst case' loading scenarios. These cases used the measured thread profile and the nominal thread profile with a stiff Lamiflex bearing. In the first model case where longitudinal (axial) normal stresses were applied in the threaded region, the stress level in the first thread was doubled in the measured thread versus the nominal thread. In the second model case where the longitudinal (axial) normal stresses were applied to the measured thread profile with and without bending moments, the elastic stresses at the first thread increased about 14% with a bending moment. In the third model case where the longitudinal (axial) normal stresses were applied to the nominal thread profile with and without bending moments, the elastic stresses at the first thread similarly increased about 14% with a bending moment. Lastly, in the fourth model case where longitudinal (axial) normal stresses were applied in the measured threaded profile with a stiff Lamiflex bearing versus a soft Lamiflex bearing, the elastic stresses at the first thread increased about 15% with a stiff bearing. The #1 spindle of the accident helicopter revealed cracking at the cotter pin hole. Additionally, inspection reports received after issuance of an emergency airworthiness directive (details below) to perform a magnetic particle inspection of the spindle threads revealed about 20% of inspected spindles showed evidence of a crack at the cotter pin hole. Because of this cracking detected on spindles in the area of the cotter pin hole, a new FE model was developed to determine if in-flight loading could have caused high stresses near the cotter pin hole that in turn induced the cracking. Peak stress values occurred in the first thread root, while no high stresses were observed near the cotter pin hole or in the pin. It was determined that the cotter pin was not significantly loaded, and not related to the inboard cracks. CT scans of the #1 and #3 spindles were completed by an independent laboratory under the direction of an NTSB investigator. The results of the CT scans showed that both the #1 and #3 spindles had indications of cracking. These crack indications were extremely faint, consistent with cracks that were very narrow. Some of the crack indications were in spindle areas where magnetic particle inspections had indicated that cracks were present. However, some of the crack indications were in areas where no cracks were indicated in the magnetic particle inspections. It could not be determined why the CT crack indications appeared in areas where no magnetic particle inspection crack indications appeared. The CT crack indications could be erroneous, caused by random noise in the images, or the cracks noted in the CT indications could be of such small dimensions that they did not create an indication during the magnetic particle inspection. Because of this uncertainty, none of the crack indications provided any information on the formation process for the cracks. On February 11, 2015, Enstrom Helicopter Corporation (Enstrom) issued Service Directive Bulletin (SDB) No. 0119, that required an MPI for MR spindles, P/N 28-14282-11 and 28-14282-13, that were in service more than 5,000 hours. The bulletin specified that the MPI should be completed within the next 5 hours of time-in-service (TIS). For MR spindles with less than 5,000 hours TIS, the spindle should be removed and sent to Enstrom for MPI at or before 5,000 hours TIS. The SDB also specified a repetitive MPI conducted every 300 hours after the initial 5,000 hour TIS. On February 12, 2015, the FAA issued Emergency Airworthiness Directive (EAD) 2015-04-51 requiring that any spindle with 5,000 hours or more TIS, or where the hours TIS of the spindle was not known, have an MPI before further flight to determine if a crack exists. If a crack in the spindle was found, replace the spindle before further flight. Results of the MPI testing for all spindles meeting the requirement were to be reported to the FAA. Based in the findings of the MPI tests conducted after the issuance of Enstrom's initial SDB, a revised SDB (Revision 1) was issued by Enstrom on April 1, 2015. The revision reduced the TIS before MPI was required from 5,000 hours to 3,500 hours. On June 1, 2015, Enstrom issued Revision 2 to the SDB further reducing the TIS before MPI was required from 3,500 hours to 1,500 hours. On April 10, 2015, the FAA superseded EAD 2015-04-51 with EAD 2015-08-51 which advised that, based on inspection reports received by the FAA, about 20% of the spindles that were MPI tested had evidence of cracks. As such, the FAA expanded the applicability of spindles requiring testing to those with 1,500 or more hours TIS. In August 2015, Enstrom conducted a flight strain survey to characterize the loads placed on the P/N 28-14282-13 spindles during normal and abnormal flight conditions to determine whether there was existence of bending loads at the spindle threads. The strain surveys revealed bending moments that were not accounted for in the original spindle analysis. Additionally, Enstrom performed a crack growth analysis to evaluate cracks about the cotter pin hole. At the time of the analysis, less than 6% of the overall spindles returned from the field exhibited cracks in the cotter pin hole (much less than the approximately 20% recorded when the FAA EAD 2015-04-51 was first released). Other than two spindles from the accident aircraft, no additional spindles were found to exhibit cracks about the inboard threaded region of the spindle. As a result of the analysis, on June 24, 2016, Enstrom issued Revision 3 to the SDB. This revision modified the original 300-hour repetitive MPI requirement to a 500-hour interval repetitive MPI after the initial MPI at 1,500 hours TIS. The Federal Register, dated March 2, 2017, announced a notice of proposed rulemaking (NPRM) to issue an airworthiness directive (AD) for Enstrom MR spindles (P/N 28-14282-11 or 28-14282-13) to establish a life limit of 1,500 hours TIS and require a recurring inspection interval of 500 hours until the spindle reaches its new life limit of 1,500 hours TIS. 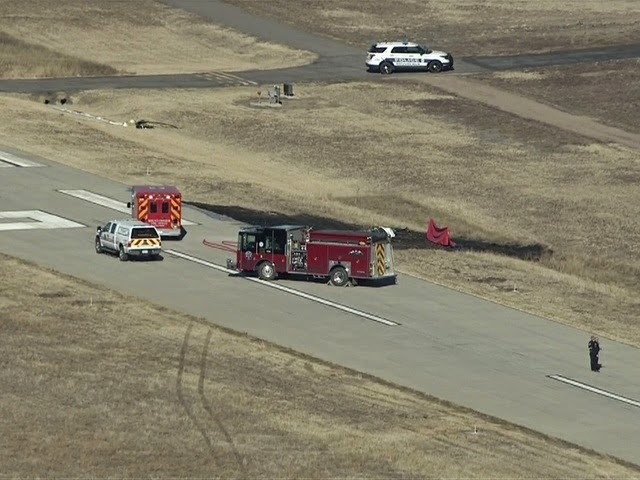 On January 26, 2015 about 1202 mountain standard time (MST), an Enstrom 280FX, N86235, was destroyed when it impacted terrain during final approach for landing at the Erie Municipal Airport (EIK), Erie, Colorado. 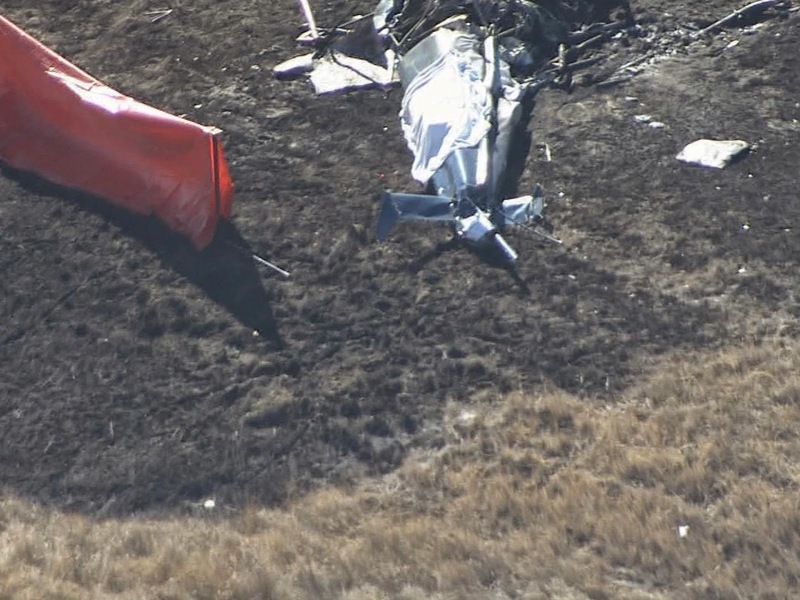 Both the instructor pilot and student pilot were fatally injured and the helicopter was destroyed. The helicopter was registered to New Course Aviation Company and operated by Mountain One Helicopters as a 14 Code of Federal Regulations Part 91 instructional flight. Visual meteorological conditions prevailed for the local flight which operated without a flight plan. A witness reported that the helicopter was on final approach for landing on the runway at what seemed a steep angle of descent. As the helicopter descended, she heard a loud "pop" and the helicopter began to rotate and then the main rotor blades departed off the top of the helicopter. The remainder of the helicopter fell to the ground, impacted, and then "exploded." 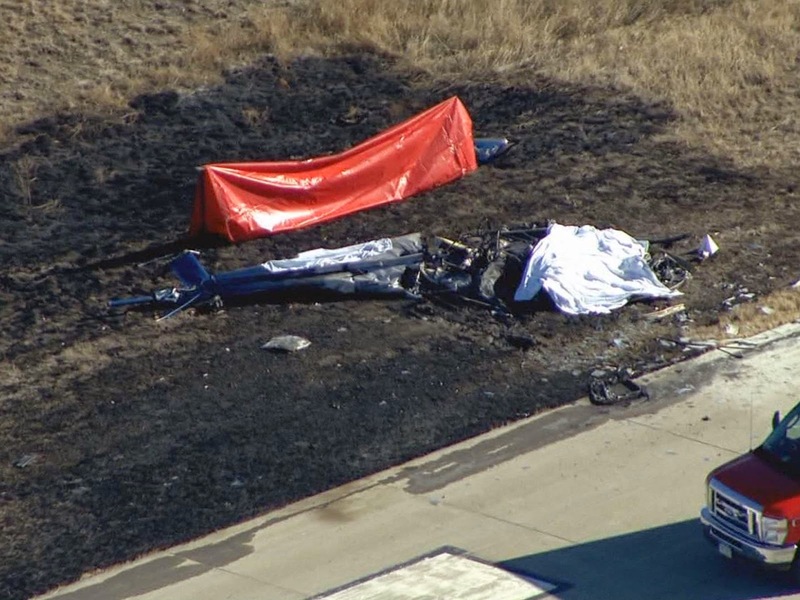 DENVER (AP) — The Federal Aviation Administration has grounded more than 300 Enstrom helicopters nationwide until they can be inspected for possible cracks like the one that may have caused a crash last month that killed two people in Colorado. In an emergency directive issued Thursday, the FAA said that the investigation into the Jan. 26 crash indicates that the helicopter's rotor blade came off because of a crack in the spindle, which holds the rotor blade in place on top of the helicopter. 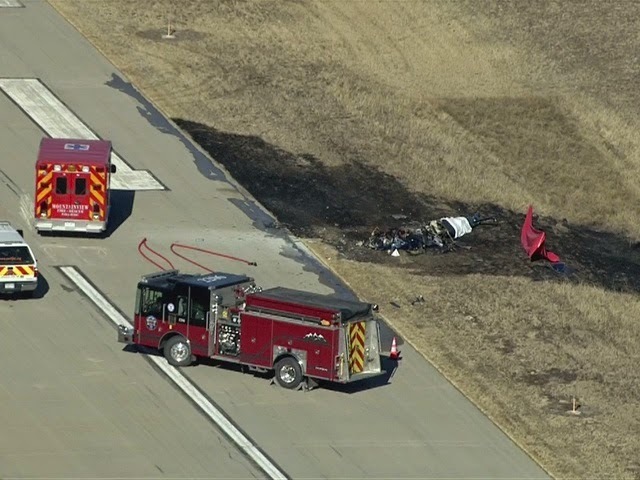 The crash, which involved a 30-year-old Enstrom 280FX, killed flight instructor Alex Viola, 23, of Arkansas City, Kansas and student pilot Amy Wood, 25, of Boulder. A witness told investigators that she saw it landing at what seemed to be a steep angle at the Erie Municipal Airport and that she heard a loud "pop" and then saw the rotor blades coming off. 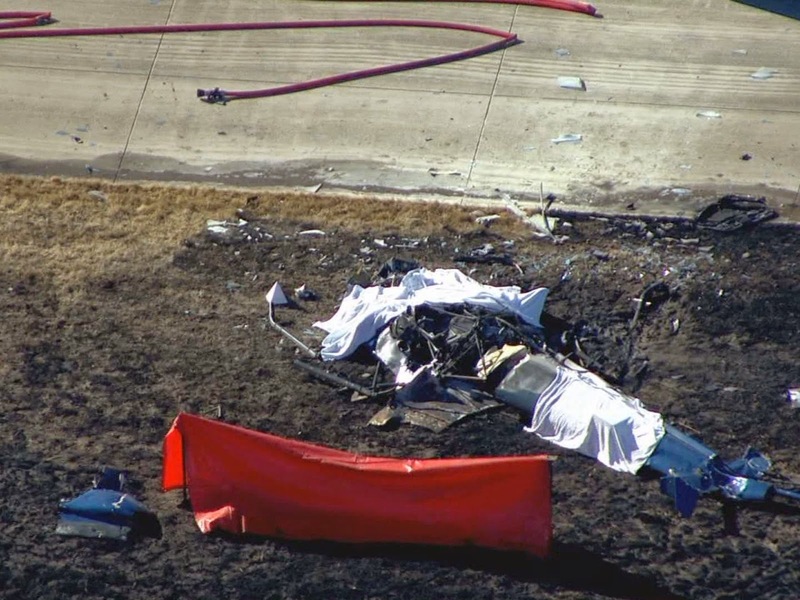 The investigation into the Colorado crash is expected to take several more months to complete, but the FAA sometimes issues such emergency directives when it finds a condition that might affect the immediate safety of aircraft, agency spokesman Lynn Lunsford said. The FAA order applies to 323 Enstrom helicopters in a range of models that are registered in the United States. Police and the military in Thailand, Japan and Indonesia also use the same type of aircraft, according to Enstrom's website. 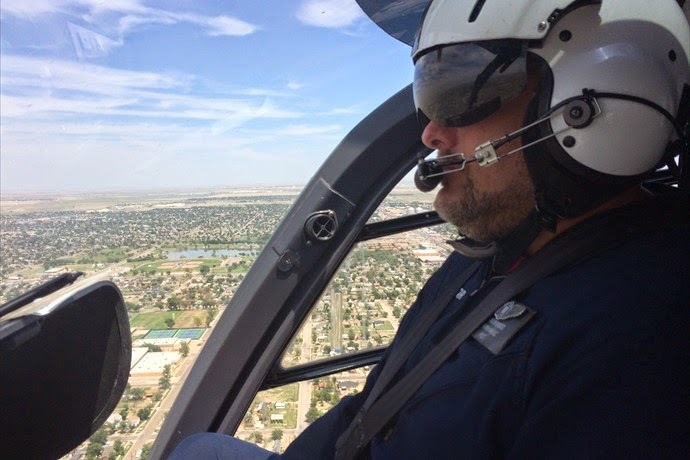 The FAA says owners should not fly the helicopters until having an experienced agency inspector perform an X-ray-like test called a magnetic particle inspection to look for cracks in spindles that have 5,000 hours or more of use. If a crack is found, the FAA says it must be replaced before the helicopter is flown. The FAA directive largely mirrors a service bulletin by Michigan-based Enstrom to its operators worldwide on Wednesday, although the company gave operators some leeway to fly aircraft to service centers in order to be inspected. While the company is taking the issue seriously, president Tracy Biegler said there's no evidence cracks have been a problem on any other aircraft in the company's 55 year history. The lawyer for Viola's family, Gary Robb of Kansas City, Missouri, said he plans to sue the company over the crack. He praised the FAA for acting so quickly to try to prevent further crashes. "This is what this industry and what our regulatory authorities should be doing," he said.